The Safari cache on iOS seems useful at first since it stores websites data on the memory making it easier for users to come back to the web page later on. However, while it sounds good, this becomes a problem later on as this safari caches keep piling up eating deep into the storage of your device and causing a lot of problems like sluggishness, crashes or hang ups. Due to this problem, it is important to clear safari caches on your iOS 11/12 without leaving a trace of it and this is what this article looks at. 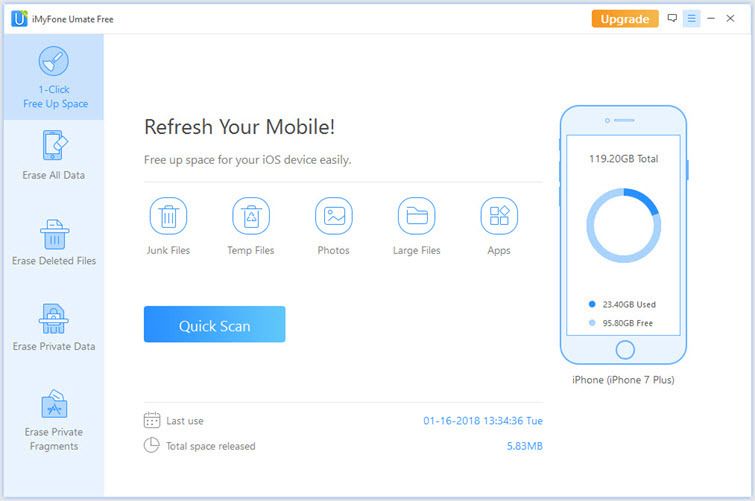 iMyFone Umate Free is designed to clear all junk files and that means it cannot only clear safari caches but can clear all other iOS 11/12 caches created by the other apps and iOS itself. It provides all in one solution for space saving and privacy protection. 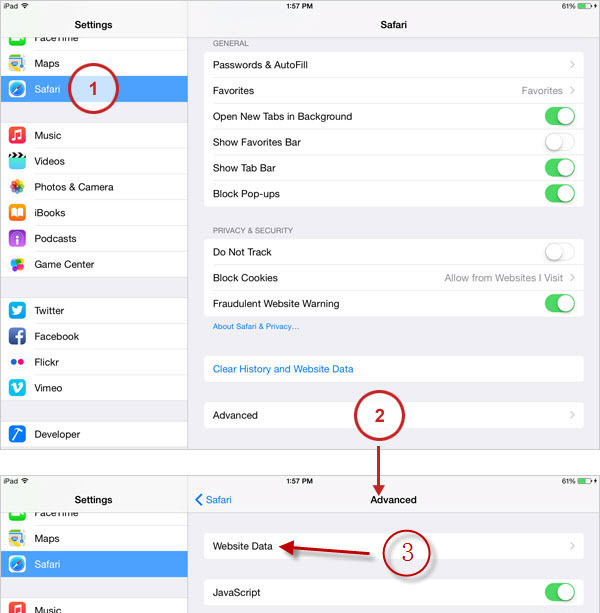 Using the iMyFone Umate Free to clear up iOS 11/12 Safari cache is easy with just few steps as seen below. Step 2: Choose the "Junk Files" option from the "1-click Free Up Space" mode, and hit Scan. When it finishes scanning, it will show you a list of your junk files. Step 3: Hit “Clean” button to clear up your iOS 11/iOS 12 caches. Clearing Safari Cache on iOS 11/12 by these 2 methods above will get the caches off iOS 11/12. However, it may not be the permanent way, some trace in deep will be left. So some website can easily access your data. Safari cache cleaned by that still has the possibility to be recovered. When the Safari cache has something to do with privacy, the consequence will be severe. For those users who concern much about the privacy issue, it will be safer to use the following method. Clearing the Safari cache is simple and easy but you have to make sure that all restrictions on your iOS device are removed. Some people have passwords for accessing websites and applications, and if you are one of those, then you will face certain difficulty in removing all the unnecessary website content. Users, who are looking to clear cache Safari on iOS 11/12, must ensure that any restrictions blocking website content are removed before hand. Go to the Settings and tap on Safari. Tap on the option that says ‘Website Data’. See how much space it is taking up and press ‘Remove All Website Data’. To make the Safari cache cleared without chance of recovery or without any trace, you’d better consider iMyFone Umate Pro to completely clear Safari cache off your iOS 11 device, because it will help overwrite the Safari cache. iMyFone Umate Pro is regarded as one the best iOS 11 data erasers in the world. Data or files erased by this software cannot be recovered even with the latest recovery tools. Apart from permanently clearing the existing Safari cache on iOS 11/iOS 12, it can also find out and completely erase the preciously deleted Safari cache. Step 1: Choose the Erase Private Date (if you want to erase the deleted Safari cache, choose "Erase Deleted Files"), and hit Scan. When it finishes scanning, it will show you a list of your private data. Step 2: Check Safari Cache and you can preview first. Then choose the one you don’t need any more and hit Erase now. Type “delete” into the box to confirm. What iMyFone Umate Pro Can Do for Your iOS 11/12 Safari? Completely delete Safari data: Not only the Safari cache, but also Safari history and ccokies can be completely deleted here. No trace will be left then. You will not need to worry about your data or privacy. Completely destroyed deleted Safari data: With advanced analysis technologies, it can scan you much Safari data you deleted before. When running "Erase Deleted Files", those fragments or imcomplete data which are not shown will be destroyed as well. Thoroughly delete all app cache: You can also use "Junk Files" to clean all app cache on your iOS 11/12 device and the Safari cache is inclusive. It is free trial version. It will not only reclaim storage space but also optimized your iOS 11/12 device. 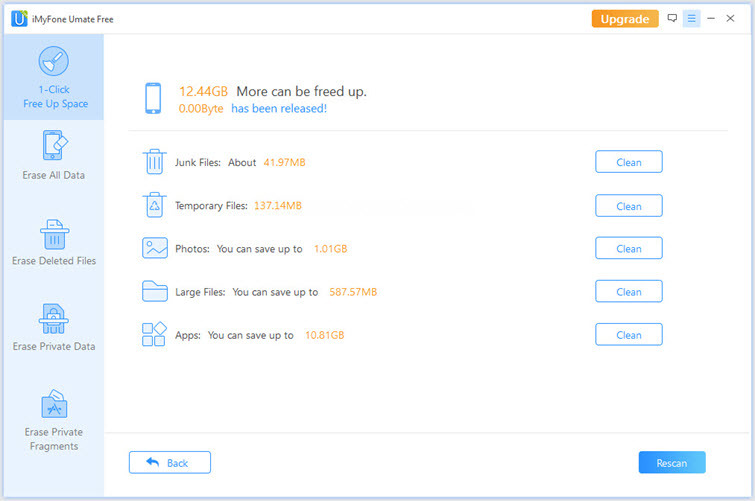 Apart from clearing Safari cache on iOS 11/12, iMyFone Umate Pro still has some other amazing features to help free up huge storage space and avoid privacy issue. In other words, it can work as a cleaner or eraser for your iOS 11/12 iPhone/iPad/iPod Touch. Erase all settings and contents on iOS device and make it new. All iOS files are supported to be erased, including messages, call history, contact, notes, photos, videos etc. Find and permanently erase the preciously removed data or files. 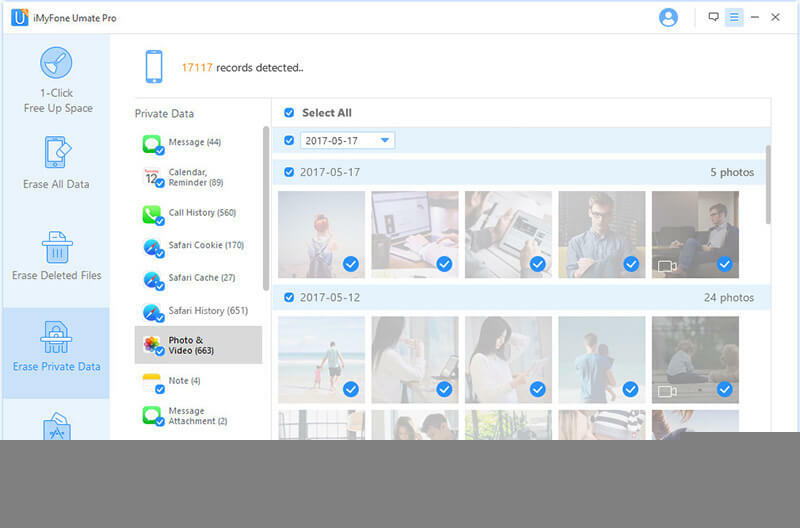 1-click to clear huge storage space by cleaning junk/temporary files, compressing photos, exporting photos/videos to PC and deleting App etc. Third pary app data can be completely deleted, like WhatsApp chats & media, SnapChat data, Wechat chats & media, etc. With it, you don’t need to clean some data or files manually step by step. You also will not mistakenly delete some important files when you free up space manually. If you want to clear up or delete music on your iPhone 7, please try this iPhone music transfer, which can freely transfer iPhone music between iPhone and iTunes/PC, as well as delete and export iPhone music.